Ever wonder how cooks in the past managed to feed their large families tasty wholesome meals every day? What was rustic kampong cooking like? Who Was a Kampong Cook? 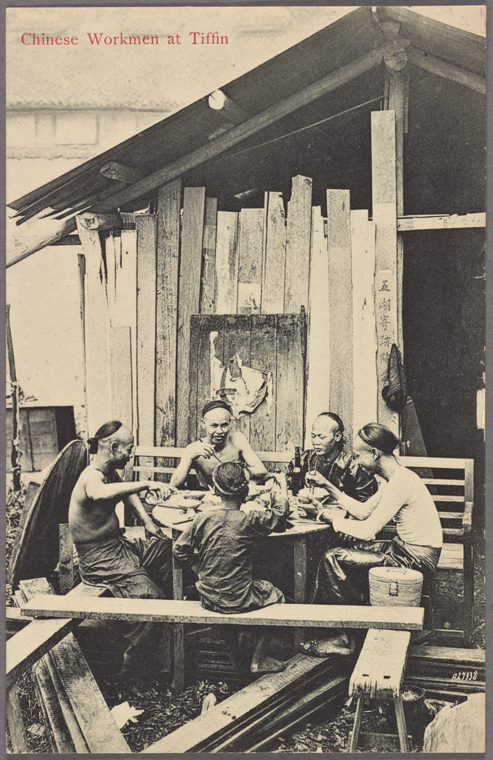 A kampong cook of early Singapore was usually a woman in charge of cooking for her large extended family. Not only did she have to cook three meals, she was also responsible for the care of young children, elderly parents, and the general running of the household. There were also laundry, livestock, vegetable gardens and cleaning to take care of. All of which she did even when pregnant! It was a hard life and yet, she managed to churn out meal after meal for her family without fail. Without the kampong cook, the family would simply starve. My grandmother, whom I called Popo, was a kampong cook. She lived in a kampong in the Jurong area after WWII. In a shabby kampong house, she raised 10 kids and cooked every single meal every day. Grandfather was a dentist with his own practice but was never well off because there were too many mouths to feed. Popo also made new clothes for her kids every year. A few weeks before Chinese New Year, Popo would go to town to buy bolts of fabric and new shoes for the kids. Then every night until Chinese New Year’s Eve, she used an old Singer sewing machine to churn out set after set of made-to-measure clothes. For the girls, she also made little cloth handbags with decorative beads on them. When her kids were older and in school, she moonlighted as an unlicensed dentist (she learned her craft from Grandfather) to make extra money for the family. She got a driver’s license and drove the family beat-up Mini to various kampongs to perform low-cost dental care. Mom, who got to tag along on these trips, still remembers fondly of the hospitality of the Malay kampongs, where the villagers fed her homemade kueh while Popo performed teeth extractions on her patients. Back in those days, there were no convenience foods or takeout from restaurants. Popo kept a few tins of luncheon meat (similar to canned SPAM) in the kitchen for hectic days. For these busy-day dinners, she would slice the meat thin and fry it until the edges turned crispy, and the family would eat the salty meat with plain rice porridge and stir fried cabbage. Another family favourite that Popo cooked on busy days was vegetable egg drop soup. She would set a large pot of ikan bilis (anchovy) broth to cook, and wash and prep large bunches of mani cai (Sauropus androgynous), a dark green vegetable that tastes like a cross between spinach and kale. The greens are stir fried in a large wok with oil and a healthy amount of chopped garlic. As the veggies soften in the wok, she’d pour the anchovy broth over the veggies and let it simmer. Right before she takes the wok off the fire, she’ll stir in a few beaten eggs and serve the sweet-salty soup over bowls of rice. This busy-day soup is now a treasured family recipe and even though she has long passed on, the memory of Popo and her soup lives on. If Popo were alive, she would tell you that anyone can prepare nutritious homemade meals for their family every day. You don’t need fancy tools or complicated recipes. All you need is practice. Remember, it’s all been done before and by people all over the world who are in all sorts of dire circumstances. Check out these tips to make home cooking easier. Start from Level 1: Find a favourite food and start with the easiest version. For example, if your family likes pizza, don’t use a recipe that calls for a made-from-scratch crust. Instead, experiment with using pita bread, tortillas or even French bread. If everyone gobbles the pizza, move on to a more advanced recipe. Have a hunger evacuation plan: Don’t panic at dinner time. Figure out what you’ll eat beforehand. Have a hunger evacuation plan aka meal plan ready. No it doesn’t have to be in a detailed spreadsheet. Just write down what want to eat for the next 7 dinners. Then repeat. No one will remember what they ate last Monday. Bring the list with you to the grocery store to figure out what to buy. Easy peasy. Use your frozen assets: Green peas, fish, bread, cookie dough, meatballs…your freezer is like a treasure chest of food. You can freeze most food with almost no ill effect. You may be too busy to cook, but you can never be too busy to microwave a frozen meal. Stock your pantry: Stock pantry essentials like oil, sugar, salt, pasta, rice, canned fish and you’ll never starve. Better yet, stock your pantry with cookies, chocolate, crackers, dried fruit and nuts, and you’ll always eat well. Plan for crazy days: You know those days when you are sick like a dog and there’s a storm outside threatening to tear down your house and “there’s nothing to eat at home”? This is when you pull out the frozen pizza/instant noodles/canned soup/crackers you’ve squirrelled away and thank your lucky stars that you have a hot meal and a roof over your head. Use your appliances: Rice cookers, pressure cookers, slow cookers, toaster ovens…if you are lucky to own one, be sure to use it. It will make your life easier. It’s not the cooking: Let’s face it, most of us don’t hate cooking; it’s the washing up after and shopping and meal planning that are exhausting. So get these obstacles out of the way – make sure the sink or dishwasher is empty before you cook; get a family member to clean up afterwards; do your shopping on a weekend when you are well-rested, instead of right after work.